The Scissors clock is a most unusual and spectacular piece with its contra oscillating compound pendulums; the bobs of these take the form of scissor handles as do the hands and winding key. 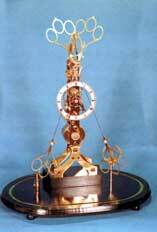 The clock runs for a week on one winding and the interesting pendulum action is a great attraction. This was the third in the series of clocks made entirely on the Unimat 3 lathe; the other two being the 16th century foliot clock and the CASTLE clock. All parts of the construction were carried out on this little lathe including the wheelcutting and the machining of the fusee. The final chapter details the construction of a simple hand operated fusee grooving tool, for those who do not wish to do this work in the lathe. In this manual reference is made to the Castle clock manual (above) for certain of the processes. Wheel Cutters Module 0.75, 0.6, 0.55 Pinions Cutters ? ?